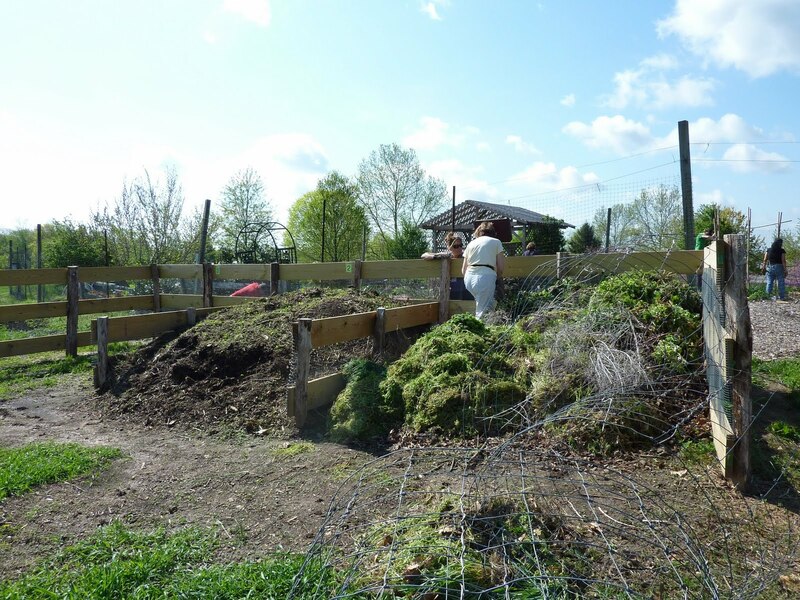 Yesterday we had our third workday of the season at the MG demo garden in Derwood, Montgomery County. The vegetable beds are beginning to take shape, as is the rest of the garden. We had previously planted seedlings of leeks as well as kale and other brassica family members (mostly under row covers to discourage pests), and yesterday we put in mustard, orach, and quinoa (which looks just like its Chenopodium relative, lamb’s quarters), as well as lots of seeds. It was warm though windy (hats and seed packets flying all over), and I kept feeling that the spring had slipped away from me – let’s hope for some more cool weather to let the late-planted spring crops mature! We are trying to garden even more vertically this year. 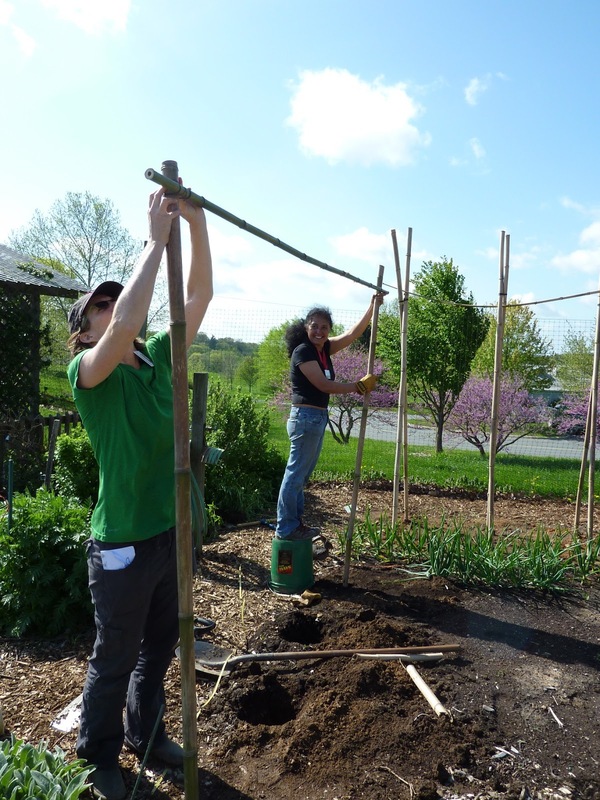 Here are MG Barbara Dunn and intern Lily Bruch putting up one of the new bamboo trellises (this one will have bitter gourds and… something else on it, and the other completed trellis visible to the side will hold luffas). The trellises are in the Asia end of the Old World part of the vegetable garden – all organized by origin of species (and when I say “organized” I mean “trying to remember to refer to my list and sketch map while desperately getting those seeds and plants in”). I hope it’ll all work out well! Signs are next, honestly. We have enormous new compost bins for our enormous output of trimmings and (safe for compost with no seeds or regenerating roots) weeds, built as an Eagle Scout project. This is just the old three-bin system writ large. We’ll dump into the first bin, and then our compost crew will move (with a front-loader, I assume) the finished compost from bin 2 into bin 3, and shred the new stuff into bin 2 so it can rot properly. And so forth. After a lot of rain we are finally getting to some tasks that might have been done a bit earlier. 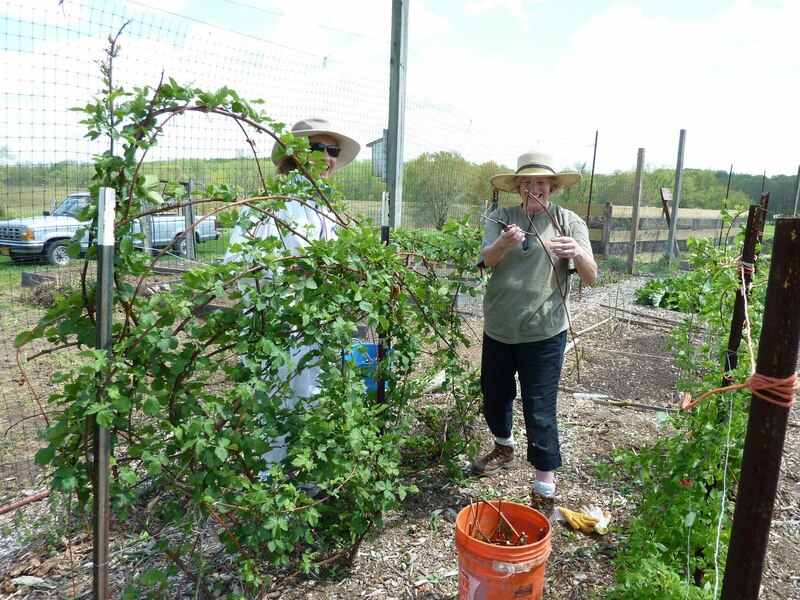 Here are MGs Judy Bradley and Mish Brousseau taming the blackberries (while discussing the Royal Family). Lots of native plants back from last season, including some lovely trilliums. I’ll give you looks at the other sections of the garden as the season goes on, along with regular (I hope) updates on the veggies. Please come visit us! We are at the Agricultural History Farm Park in Derwood, MD. You can come anytime the park is open to walk around the garden by yourself. Our workdays are Tuesday 8 am to 12 noon. 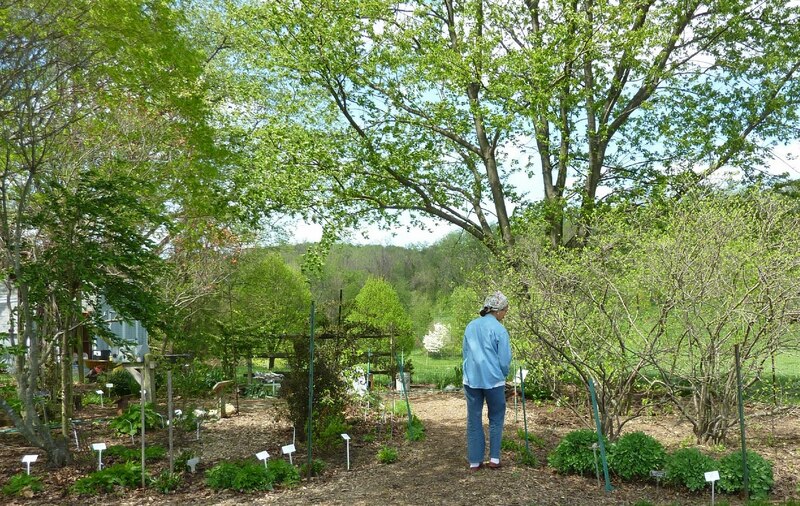 And if you have a group that would like a MG-led tour, please contact Montgomery County Master Gardeners. We love giving tours! I really like the open side on the compost so it's easy to turn and dig out when the time comes. Thanks. The idea is that the farm manager can get in with his tractor and turn materials. I think it could be replicated on a smaller scale.